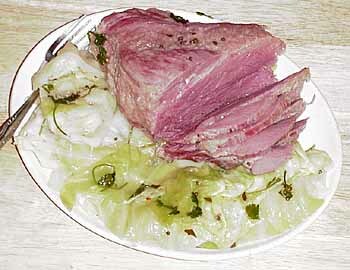 montefin's low carb Irish Food recipe for St. Patrick's Day Corned Beef and Cabbage to lose weight on The Zone Diet, South Beach Diet, Atkins Diet, Diabetes, Glycemic Index, Weight Watchers, Protein Power, Sugar Busters and other low or reduced carbohydrate diet. Place the Corned Beef in a cold, large kettle and barely cover with water. Add Bay Leaves, Black Pepper, Hot Red Peppers, Allspice and Mustard, Fennel and Coriander Seeds. Cover and simmer 1 hour per pound. 15 minutes before the beef is done, rinse Cabbage under running water, then quarter vertically. Remove the hard white stem core from the base of each wedge (my mother always gave us those as treats to eat raw while dinner simmered). Pierce each wedge with a large toothpick to hold its shape and nestle down in among the simmering corned beef and potatoes. Simmer only partly covered for the last 15 minutes to retain the beautiful green color of the cabbage. Be sure to remove all the toothpicks before serving (count them). Serve with lots of Butter, Mustard, Vinegar (I love Allen's Malt Vinegar from Canada) and Horseradish to go round. And may you arrive in Heaven an hour before the Devil knows you're dead. About 9 Carbohydrate grams per serving. Get new recipe updates by email.